The Middle East respiratory syndrome-coronavirus is a high-priority pathogen identified by the WHO R&D Blueprint because of its high fatality rate, large geographical range of the dromedary camel reservoir and lack of medical interventions. Accurate and accessible diagnostic tests are essential to outbreak containment and case management, as well as surveillance in both humans and animals, but available diagnostic tests are limited by inconsistent quality assessment, specimen acquisition issues and infrastructure requirements. Diagnostic research and development (R&D) needs to include point-of-care testing options, syndromic panels for differential diagnosis, a greater understanding of viral and antibody kinetics, improved access to clinical specimens, and establishment of international reference standards. The Middle East respiratory syndrome-coronavirus (MERS-CoV) is an emerging virus associated with severe respiratory illness, first detected in 2012 in Saudi Arabia.1 As of 30 October 2018, the WHO has been notified of more than 2254 laboratory-confirmed cases of MERS-CoV infection from 27 countries, including 800 deaths (figures 1 and 2).2 MERS-CoV is one of the high-priority pathogens identified by the WHO R&D Blueprint because of its high fatality rate (~35%) for severe cases, large geographical range of the reservoir and lack of medical countermeasures, with critical knowledge gaps in veterinary and human epidemiology, immunity and pathogenesis.3 4 Currently, there are no licensed vaccines or therapies specific to MERS-CoV. 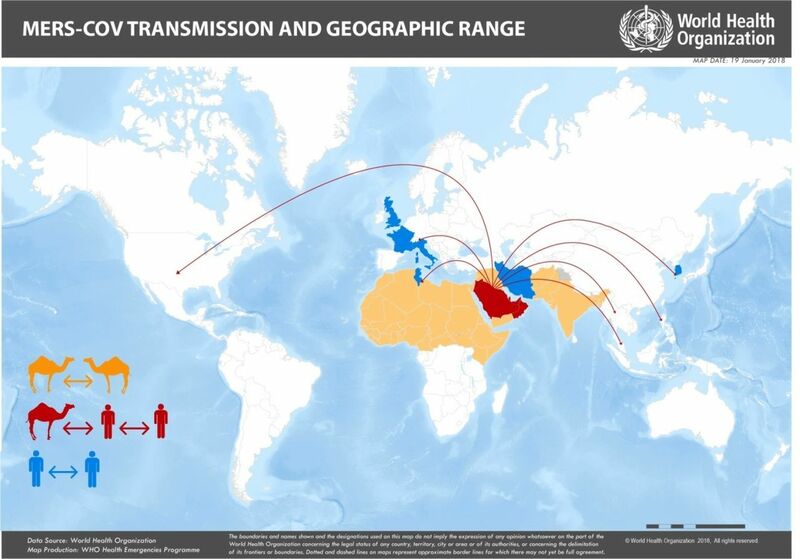 MERS-CoV transmission and geographical range. Reprinted from emergencies preparedness, response—Middle East respiratory syndrome-coronavirus (MERS-CoV), WHO, MERS-CoV transmission and geographical range. Copyright (2018). Confirmed global cases of MERS-CoV as of 18 September 2018. Reprinted from emergencies preparedness, response—Middle East respiratory syndrome-coronavirus (MERS-CoV), WHO, MERS-CoV transmission and geographical range. Copyright (2018). The WHO R&D Blueprint for Action to Prevent Epidemics is a global strategy and preparedness plan to strengthen the emergency response to highly infectious diseases, including MERS-CoV, by fast-tracking the development of effective medical technologies that can be brought to patients during epidemics.4 This landscape analysis, complementary to the recent Food and Agriculture Organization (FAO)-Office International des Epizooties (OIE)-WHO MERS Global Technical Meeting report,5 provides an overview to the current status of MERS-CoV diagnostics, including feedback from subject matter expert and developer interviews on the common challenges with test development and implementation, and identifies gaps for further research and development (R&D). The molecular epidemiology for MERS-CoV has not changed significantly since the initial human cases were detected in 2012. The current virus remains 99% identical to the sequences seen in the first human cases from 2012 as well as archived camel sera from 1983, with no increase in pathogenicity observed in the animal host.50–52 As genetic mutations could impact detection, immunotherapy and vaccine development efforts,53 sequencing of MERS-CoV strains from camels and humans (after a zoonotic spillover) is important and is regularly being conducted in affected member states (WHO, personal communication, 2018). The best NAAT test sensitivity is achieved using specimens from the lower respiratory tract (sputum, tracheal aspirates or bronchoalveolar lavage), where MERS-CoV replication occurs at higher and more prolonged levels of MERS-CoV RNA, typically between 106 and 1010 copies/mL.72 75 MERS-CoV viral load is generally higher for severe cases, with more prolonged viral shedding than mild cases. Viral load concentrations, which may be undetectable at early-stage infection, generally peak in the second week after symptom onset, and then drop to undetectable in survivors by the fourth week from onset. Serological diagnosis can be made using paired samples, more often used for research rather than diagnostic purposes, preferably with the initial sample collected in the first week of illness and the second collected 3–4 weeks later. If only a single serum sample can be collected, this should occur at least 3–4 weeks after onset of symptoms for determination of a probable case. Table 1 presents an overview of the implementation requirements for MERS-CoV diagnostics (detailed commercial product information is presented in online supplementary tables S1 and S2). Molecular diagnostics such as NAAT (eg, PCR) typically require sophisticated laboratory infrastructure including biosafety cabinets,79 while most serological tests (ELISA, indirect immunofluorescence test (IIFT)) can be run on the benchtop in a more modest laboratory environment, depending on sample preparation precautions.80 81 Point-of-care (POC) tests are designed to be used outside of a traditional laboratory; near-POC tests are defined for rapid use in a laboratory near the patient, but are more automated and easy to use than the traditional laboratory test.72 75 POC tests such as low-complexity rapid diagnostic tests (RDTs) can be used at the bedside, typically with non-invasive samples after minimal training. Inhouse tests are described in sections below; commercial sources are listed in online supplementary tables S1 and S2. NAATs are currently the standard for MERS-CoV diagnosis, as these tests (typically reverse transcriptase PCR (RT-PCR)) have the highest sensitivity at the earliest time point during the acute phase of infection. Following the WHO guidelines, two different targets on the MERS-CoV need to be detected by RT-PCR to confirm a case. MERS-CoV assays to detect the upstream envelope gene (upE) followed by confirmation of open reading frame 1A (orf1a), 1B (orf1b) genes or nucleocapsid (N) genes for confirmation have been developed.55 82 Most commercial PCR tests perform parallel screening for the upE gene with confirmation by the orf1a, orf1b or N genes (most commonly upE + orf1a). Initial NAAT tests for MERS-CoV were developed as inhouse tests, following the first detection of MERS-CoV in the Middle East.83–86 Inhouse tests are not necessarily subject to quality control or regulation, and may not be rigorously validated; in some cases, inhouse tests are eventually developed into commercial products through collaboration and licensing efforts.50 83 84 87–89 Commercial assays may undergo an international and/or incountry regulatory process; once on the market they can be independently evaluated for sensitivity, specificity and limit of detection.78 90 As of 2018, there are several commercial NAAT tests available for MERS-CoV, including duplex and multiplex panels (see online supplementary table S1). At the early stages, the symptoms of MERS-CoV infection can mimic diseases such as influenza, pneumonia, SARS and other respiratory infections. A syndromic approach involves testing for pathogens based on a syndrome such as fever or acute respiratory distress; a shift from individual tests to multiplex panels can quickly identify or eliminate likely pathogens from a single specimen. For analysis of circulating reservoirs, multiplex microbead-based immunoassays have been used to detect IgG antibodies for multiple pathogens.98 99 Multiplex, syndromic panels that include MERS-CoV have been demonstrated using PCR-based panels including MERS-CoV, showing similar limits of detection to single assays.89 100 101 Commercial respiratory panel tests including MERS-CoV have also recently been developed (see online supplementary table S1). In particular, the development and validation process for new diagnostics could be accelerated if well-characterised specimens and reference standards could be more easily obtained. EQA can be useful for evaluation of test performance, as shown with evaluations of both inhouse and commercial assays for MERS-CoV,111–113 and more recently a global proficiency testing programme used to assess laboratory detection of MERS-CoV.114 Even after validation, a substantial amount of reference material is required for quality control; often manufacturers must develop their own calibration standards to maintain supply and to control lot-to-lot variability. International reference standards and qualified specimen panels can accelerate the development and validation of diagnostic tests. In particular, the WHO International Biological Reference Preparations (as provided by member states) serve as reference sources for ensuring the reliability of in vitro biological diagnostic procedures used for diagnosis of diseases and treatment monitoring, including MERS-CoV. Several international institutes also provide specimens for validation; these groups typically have a defined pathogen/disease focus with a corresponding archive of biological reference materials; however, the supplies may be limited (see online supplementary material 1). Serological RDTs are ideal for low infrastructure settings such as a primary health clinic, home or field testing. However, specimen collection remains a key challenge for MERS-CoV, as the recommended lower respiratory specimens are difficult to obtain outside of a hospital setting. Upper respiratory specimens such as nasal swabs are easy to obtain and work well in conjunction with RDTs for camels, but these specimens generally have low virus titre in humans, thus limiting current use of RDTs to animal testing.87 92 96 Improvement of the current RDT detection chemistry, if feasible, may support the future use of these tests in humans, at least for rapid triage in highly infectious cases. POC and near-POC microfluidic platforms enable a more flexible, but still highly sensitive approach for near-patient NAAT testing in decentralised settings. Near-POC NAAT platforms are compact and self-contained, with automated sample preparation for processing in minimal laboratory settings, which most healthcare workers can be trained to operate within a day.119–121 Recent publications describe MERS-CoV assays designed for POC PCR,89 loop-mediated isothermal amplification assay122 and paper-based sensor detection123; however, no MERS-CoV assays are currently available for the existing near-POC platforms. Given that PCR is now the standard for MERS-CoV diagnosis, it would be highly desirable to have an automated, self-contained NAAT assay that can be readily deployed in a field or clinic setting. Syndromic testing can be valuable during the early stages of an outbreak, in order to distinguish MERS-CoV from other respiratory infections or identify cases of coinfection.100 124 A syndromic panel could be effective in expediting pathogen and outbreak identification, especially with technologies that can screen for multiple pathogens simultaneously.125 Using the panel approach, a definitive diagnosis could enable timely decisions about triage, treatment, infection control and contact tracing.126 While the per-test cost rises with test complexity, including additional reagents and more sophisticated instrumentation, a rapid and efficient diagnosis scheme can impact intervention and infection control and can be cost-saving overall.127 128 As respiratory diseases are both regional and seasonal,129–131 region-specific panels may be more cost-effective.132 Multiplex panels offer the alternative for a ‘bundled’ testing paradigm; however, if not routinely used (if the market is small), then developers may be reluctant to support the test for diagnostic use, which requires additional investment for validation and regulation. Surveillance can be an effective method to identify the initial stages of outbreak, but it requires routine and effective sampling. The impact of surveillance testing depends on the test sensitivity and specificity, sampling rates, kinetics of the disease, and whether the target is animal or human populations. Most surveillance sampling is performed in the field, either through population-based or ‘hot spot’ sampling. For MERS-CoV, it may be difficult and expensive to implement routine surveillance in dromedary camel stock, as they represent a significantly large reservoir but may suffer only mild effects from MERS-CoV infection, if any. The ideal surveillance tool would be a highly sensitive and field-appropriate screening test. Per-test cost is also an important factor along with ease of implementation. This review has identified diagnostics currently available for MERS-CoV and highlighted ongoing challenges caused by critical gaps in diagnostics to support outbreak management. RDTs offer the potential for rapid POC screening for MERS-CoV; however, there are practical limits to implementing lower respiratory sample acquisition outside of a hospital setting, limiting feasibility. POC or near-POC NAAT platforms provide an opportunity for implementation of automated, self-contained testing in hospitals and clinics with limited training in endemic-prone areas. Expansion of test menu options for existing POC or near-POC NAAT platforms will strengthen incountry response capacity to endemic diseases and simultaneously ensure countries are prepared for future pandemics. Syndromic multiplex panels may expedite differential diagnosis of MERS-CoV from other endemic respiratory diseases, but further analysis is needed to inform implementation and cost-effectiveness in the context of regional and seasonal detection. There is also a need for more sensitive serological assays with lower cost and minimum cross-reactivity that can be used as surveillance tools. A more detailed understanding of MERS-CoV viral and antibody kinetics is needed across the broad range of sample types in order to optimise the use of existing assays and to address ongoing technical challenges in the detection of mild and asymptomatic infections. 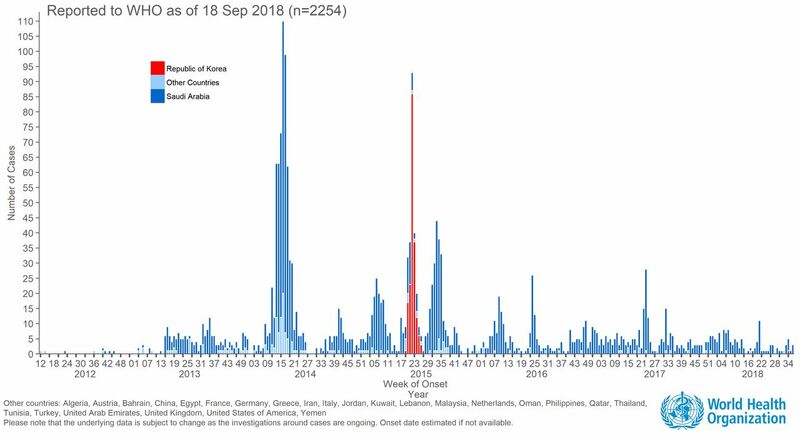 Surveillance continues to be important for the detection of MERS-CoV spillover events; however, questions remain on the cost-effectiveness of routine screening of the large reservoir camel population. In addition, support towards sample biobanks with well-characterised specimens and reference standards will facilitate diagnostic development and quality assurance for MERS-CoV diagnostics worldwide. In order to achieve the goals of the R&D Blueprint efforts, WHO is identifying key Target Product Profiles for diagnostics in order to mobilise funding and resources to support the development and implementation of the most critically needed tests. We gratefully acknowledge input to the roadmap from all those who attended the FAO-OIE-WHO Global Technical Meeting on MERS-CoV in September 2017. The opinions expressed in this article are those of the authors and do not necessarily reflect those of the institutions or organisations with which they are affiliated. Editorial assistance for later drafts was provided by Rachel Wright, PhD, funded by FIND, according to Good Publication Practice guidelines. , 2017. WHO | Middle East respiratory syndrome coronavirus (MERS-CoV). WHO MERS-COV. Available from: http://www.who.int/emergencies/mers-cov/en/ [Accessed 12 Sep 2017]. , 2016. R&D Blueprint Plan of Action (2016). Available from: http://www.who.int/entity/blueprint/about/r_d_blueprint_plan_of_action.pdf [Accessed 12 Sep 2017]. , 2017. R&D Blueprint for action to prevent epidemics.. Available from: http://www.who.int/blueprint/en/ [Accessed 12 Sep 2017]. , 2018. Food and Agriculture Organization of the United Nations. MERS-CoV situation update, Map 1. MERS-CoV livestock field surveys by country. Available from: http://www.fao.org/ag/againfo/programmes/en/empres/mers/img/map1_2017_12_20.jpg [Accessed 21 Mar 2018]. , 2017. MERS CoV: OIE - World organisation for animal health. Available from: http://www.oie.int/scientific-expertise/specific-information-and-recommendations/mers-cov/ [Accessed 29 Sep 2017]. , 2016. Middle East Respiratory Syndrome (MERS) | Symptoms & Complications | CDC. Available from: https://www.cdc.gov/coronavirus/mers/about/symptoms.html [Accessed 10 Apr 2018]. , 2014. WHO | Infection prevention and control (IPC) guidance summary. WHO. Available from: http://www.who.int/csr/disease/ebola/evd-guidance-summary/en/ [Accessed 1 Feb 2018]. , 2018. WHO recommended surveillance standards, Second edition. WHO. Available from: http://www.who.int/csr/resources/publications/surveillance/WHO_CDS_CSR_ISR_99_2_EN/en/ [Accessed 1 Feb 2018]. , 2016. Middle East respiratory syndrome coronavirus: Virology, pathogenesis, and epidemiology. Available from: https://www.uptodate.com/contents/middle-east-respiratory-syndrome-coronavirus-virology-pathogenesis-and-epidemiology#references [Accessed 11 Sep 2017]. , 2017. WHO | MERS-CoV Vaccine TPP. WHO MERS-COV VACCINE TPP. Available from: http://www.who.int/blueprint/what/research-development/MERS_CoV_TPP_15052017.pdf [Accessed 12 Sep 2017]. , 2018. Laboratory testing for Middle East Respiratory Syndrome Coronavirus. WHO. Available from: http://www.who.int/csr/disease/coronavirus_infections/mers-laboratory-testing/en/ [Accessed 21 Mar 2018]. , 2004. WHO | Laboratory Biosafety Manual - Third Edition. WHO. Available from: http://www.who.int/csr/resources/publications/biosafety/WHO_CDS_CSR_LYO_2004_11/en/ [Accessed 19 Mar 2018]. , 2014. WHO | Laboratory testing for Middle East Respiratory Syndrome Coronavirus. WHO MERS-COV Lab. Test. Available from: http://www.who.int/csr/disease/coronavirus_infections/WHO_interim_recommendations_lab_detection_MERSCoV_092014.pdf [Accessed 12 Sep 2017].
. Using Healthmap to analyse Middle East Respiratory Syndrome (MERS) data. Stud Health Technol Inform 2016;226:213–6. , 2017. WHO | Influenza surveillance outputs.. Available from: http://www.who.int/influenza/resources/charts/en/ [Accessed 29 Sep 2017]. , 2014. WPRO | second meeting on laboratory strengthening for emerging infectious diseases in the Asia Pacific Region. WPRO. Available from: http://www.wpro.who.int/emerging_diseases/meetings/docs/report_2nd_lab_EID/en/ [Accessed 13 Sep 2017].